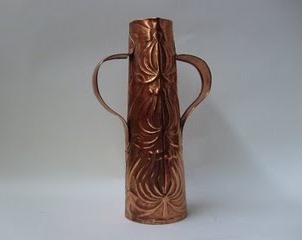 This entry was posted in Collections, My favourite object and tagged Arts and Crafts, Crafts, Elizabeth Waterhouse, metalwork. Bookmark the permalink. Very interesting post – it would be interesting to investigate Yattendon in more depth. Clearly there was a lot going on there in the late nineteenth century: Robert Bridges lived there at the same time, and married Alfred and Elizabeth’s daughter Monica, so there was a poetry and music dimension to Yattendon too. My sense is that there may have been a project of rural cultural revival at work, almost a smaller-scale and earlier version of Dartington Hall. It would be a good subject for an article or perhaps even a PhD. Thank you for your comment, Jeremy – I think Yattendon would be an excellent subject for further research. It would be interesting to locate any records on the output of the Guild. Jill Greenaway (who I think might be a curator at Reading Museum) wrote a chapter on Elizabeth Waterhouse in the publication ‘In the Valley of the Pang’ indicating that records for the business between 1902 and 1914 do exist – I am trying to get in touch with her at the moment. I have been in contact with a member of the Waterhouse family and also the Berkshire Record Office but they do not have any business records for the Guild and suspected they might be in private ownership. If anyone has any further information on this, please do let me know! 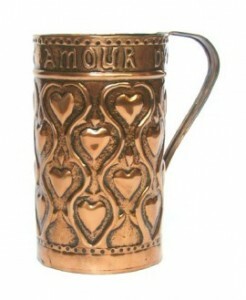 It would also be interesting to locate other examples of Yattendon metalwork. I understand that the West Berkshire Museum has a similar tall vase to the one I talked about in my post. I’ve added links to the online database records for the two pieces of Yattendon-ware held by MERL into Fiona’s blog post so you can see what information we hold about the items we have. Fiona is right that they have Yattendon Guild collections at the West Berks Museum, though I’m unsure of the precise detail of these. Perhaps there is scope for a joint exhibition at some point. Hopefully John Holmes (https://www.reading.ac.uk/english-literature/aboutus/Staff/j-r-holmes.aspx) will touch on some of this stuff when he does his ‘pop-up’ exhibition at MERL this Autumn. Pop-up exhibitions are brief interventions whereby specialists and people with research interests in the collections select items from the reserve collections to display over the course of a single lunchtime. John is focusing on Waterhouse-related items. So, this will offer us an opportunity to get out just a few items connected with the Waterhouse family and discuss and explore them in greater depth. Dates and final content to be confirmed but keep an eye on the Museum’s website for details.